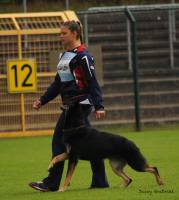 We only breed titled and health tested German Shepherds from European lines. All breeding stock is titled and has the bare minimum of certified hips and elbows clear of dysplasia. 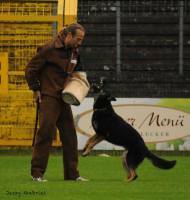 Breeding dogs must be good representations of the breed with correct temperament and drives. Kona v. Eichenluft receives another IPO3 title at the 2016 Universal Sieger WORLD Championship! (Arko v Eichenluft X Jabina Gitti) received his IPO3 at the Mid Eastern Regional Championship in 2018​! !